THE NAKED AND THE DEAD , the 1958 run at Norman Mailer’s 1948 blockbuster WW2 novel, would have been better regarded at the time and remembered today had not familiarity with the book—long, dense, brutal and cynical— jaundiced critics and viewers against it. 131 minutes naturally streamline the books 800-odd pages, and change, rearrange or dump incidents, and only briefly nod at the books nasty sexual content. Of course, the profanity had to go. Even editorially softened into a kind of ‘Mature Classics Illustrated’ package, it’s still a pretty rough customer, paradoxically displaying the sort of clout Warner Brothers had with the Dept.of Defense by getting their co-operation despite the less-than-wholesome portrayal of the Army, officers and men alike. The harsh tone is set from the get-go, with Bernard Herrmann’s pounding, atavistic title theme. After a few minutes of crass folderol in a Honolulu clip joint, legendary macho director Raoul Walsh ships his cast of ‘types’ to a Pacific island invasion, where they sweat, complain, kill and die for the duration of the film, apart from scattered flashbacks to dismal or tawdry civilian life. A different kind of odor wafted from star Aldo Ray: according to producer Paul Gregory, Ray was constantly plastered during the filming. Booze-basted or not, the burly, rasp-voiced Ray serves up a believably malevolent ‘Sgt.Croft’, more dangerous to be around than the Japanese. Cliff Robertson’s lieutenant provides quiet liberal conscience, Raymond Massey’s general radiates cold and arrogant class warfare. The squad: William Campbell, Joey Bishop, L.Q.Jones, James Best, Robert Gist, Richard Jaeckel, Jerry Paris. Panamanian jungle served as locations. The book had little action (Mailer served in The Philippines, as a cook, he saw limited combat, went on one patrol), but concentrated on the psychological battles of its characters and was exemplary in conveying the exhaustion and confusion they felt. Walsh and his writers upped the battle angle: there are several tense, merciless engagements. 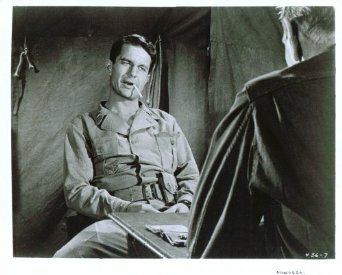 The director, an old hand at action (Objective Burma), is greatly aided by Herrmann’s ominous music to keep the mood edgy. There’s a memorably icky snakebite scene. Charles Laughton had wanted to direct it and wrote a script after producer Gregory bought the rights from Mailer. Gregory had produced Laughton’s directorial debut, the terrific The Night Of The Hunter, but its failure discouraged the actor so deeply that he dropped out and Walsh stepped in. Laughton never directed again, a real loss, as it’s almost certain his take on the story would have been less blunt and traditional than Walsh. With dismissive reviews, it still made it to spot #37 for the year, grossing $6,600,000. It’s better than the reception indicates and certainly holds your attention. Not a feel-good flick. With Max Showalter and John Beradino.